Centre for Civil Society, University of KwaZulu Natal, Durban, South Africa. Presenter: Henrik Valeur. Chair: Shauna Mottiar. Platform for Asian Architecture and Urbanism at Kamla Raheja Vidyanidhi Institute for Architecture and Environmental Studies, Mumbai, India. Panel: Gaurav Roy Chaudhary, Ranjana Dave, Avijit Mukul Kishore, Khaisri Paksukcharern, Archana Hande, Sheema Fatima, Bishakha Datta, Renu Savant, Suprio Bhattacharjee, Lubaina Rangwala, Ritesh Uttamchandani, Apidaree Kasemsook, Simon Shu, Durganand Balsavar, Mufaddal Husein, Henrik Valeur and Vandana RanjitSinh. Moderators: Ashok Lall and George Jose. Asia Energy Conference, University of Copenhagen, Denmark. Organized by Energy Crossroads Denmark. Panel: Flemming Ytzen (moderator), Peggy Mischke, Neelabh Singh and Henrik Valeur. Open forum at City Art Museum, Chandigarh, India. Organized by ART WORKLTD, London, and Between Friends, Chandigarh. Respondent: Shri Pawan Bansal, Indian Minister of Science and Technology. Panelists: Henrik Valeur and Prof. John Bass, University of British Columbia, Canada. Moderator Jyoti Kamal, senior editor for CNN. 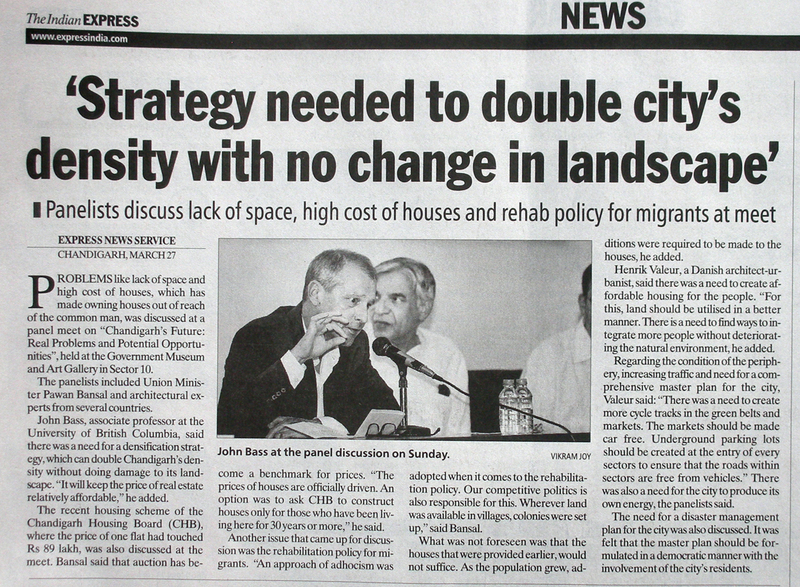 The population of Chandigarh is expected to double within the next 20-30 years. This may stimulate development and give many people the possibility of a better life, but it may also lead to social and environmental disaster. National seminar at MCM DAV College for Women, Chandigarh, India. Panel: Raminder Chaudhary, Simmi Hans, Neena Singh and Henrik Valeur. The seminar will provide a platform for academicians, research scholars, students, NGO’S and industry representative to converge and study in detail the global environmental issues affecting climate change, effect of climate change and its mitigation. Roundtable organized by Young Indians, Confederation of Indian Industry. Panel: Sumit Kaur, Henrik Valeur and Rajnish Wattas. The discussion aims to bring a representative set of all stakeholders, namely citizens, young professionals, corporates, Government, academia, urban planners, etc. to deliberate and suggest innovations in planned urbanization that can begin a conversation to plan for these new planned urban areas which will form the landscape of India’s future. 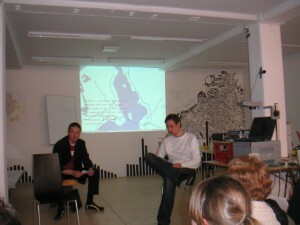 Seminar at Louisiana Museum of Modern Art, Denmark. Organized by UiD and GLB&D. Presenters: Henrik Valeur, Dominic Balmforth, Søren Leth and Tanja Jordan. Symposium at the School of Architecture in Copenhagen, Denmark. Organized by UiD, GLB&D and the Center for Urban Planning. Panel: Alejandro Gutierrez, Vanessa Miriam Carlow and Victor Tenez Ybern. Moderators: Henrik Valeur and Prof. Jens Kvorning. How does climate change influence the way we use and plan our cities? 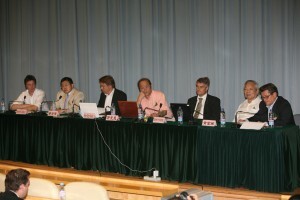 Symposium at Bridge 8 in Shanghai, P.R.China. 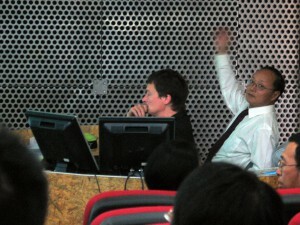 Organized by the Architectural Association School of Architecture in London, FAR Architecure Center in Shanghai and UiD. Presenters (Session one: Future Visions): Alejandro Gutierrez, Bittor L. Sánchez-Monasterio, Greg Girard, Henrik Valeur, Stephen Wang, Su Yunsheng, Xiangning Li, Xu Wei Guo and Zhao Min. Speakers (Session two: Urban Culture and Creativity): Anson Chan, Defne Ayas, Gao Yan, Giel Groothuis, Jeb Beresford, Lydia Kim, Rebecca Catching, Richard Wei-Tse Wang and Tom Verebes. The objective of the symposium is to expose the projective imagination of a generation at the forefront of Chinese urban culture and to demonstrate the range of cultural and technological innovations occurring across a variety of design disciplines. Symposium at the Centre for the Urban Built Environment in Manchester, UK. Organized by CUBE, DAC | Danish Architecture Centre and UiD. Panel: Henrik Valeur, Vanessa Carlow and Samuel Y. Liang. Moderator: Simon Guy. Will the eco-friendly cities of the future be “Made in China”? What role will architects and urban planners play? What can East and West learn from each other? Forum de Debates at the 7th Sao Paulo International Biennial of Architecture, Brazil. Panel: Henrik Valeur, Kolja Nielsen and Sinus Lynge. Moderator: Francisco Spadoni. Session entitled “the construction of urban identity” at the 51st IFHP World Congress in Copenhagen, Denmark. Organized by IFHP, Realdania and the City of Copenhagen. Panel: Henrik Valeur et.al. No surprise, these processes of rapid and extensive urbanization and the associated new urban lifestyles, exert tremendous pressure on both local and global environments. But they also produce an urban population somehow lost in transition. Forum about CO-EVOLUTION at the 51st IFHP Student Congress in Copenhagen, Denmark. Organized by IFHP, Realdania and the Royal Academy of Fine Arts, School of Architecture. Panel: Carsten Primdahl, Liang Wei, Tue Foged and Vanessa Carlow. Moderator: Henrik Valeur. Co-evolution is the title for the prize-winning work of young Danish architecture offices in collaboration with Chinese universities for the 2006 Venice Biennale. The session will focus on a discussion of the proposals by the four offices dealing with the issue of sustainable development in rapidly urbanizing areas in China. Conference at Shanghai Urban Planning Exhibition Center, P.R.China. Organized by UiD, Tongji University and General Danish Consulate of Shanghai. Panel: Prof. Li Wuwei, Shanghai Social Science Institute and Vice Chairman of Shanghai People’s Congress. Mr. Peder Baltzar Nielsen, Chief Consultant, Danish Ministry of Environment. Prof. Huang Fuxiang, Former Director of Shanghai Urban Planning and Design Institute. Mr. Søren Hvilshøj, Marketing Director of Environment, Water and Energy, Grontmil |Carl Bro. Moderators: Henrik Valeur and Prof. Pan Haixiao. Seminar at The Royal Academy of Fine Arts in Copenhagen, Denmark. organized by CPH:DOX and onedotzero. Speakers: Andreas Ruby, Bjarke Ingels and Nic Clear. Moderator: Henrik Valeur. Xi’an International Conference of Architecture and Technology, P.R.China. Organized by the Chinese Academy of Engineering and Xi’an University of Architecture and Technology. Panel: Henrik Valeur et.al. In the 21st century, based on rapid economic growth for the past twenty years, China is witnessing a new epoch with great opportunities and challenges. Out of strategic concern of sustainable and scientific development, the Chinese government aims at building a harmonious society with energy-efficiency and harmony with nature. It is a significant topic for the studies in both natural and social sciences right now and in the times to come. The Street: an Urban Platform? Panel-debate at Guangdong Museum of Art, P.R.China. Organized by the 2nd Guangzhou Triennial of Contemporary Art. Panel: Henrik Valeur, Yu Bochun and Francois Geindre. Moderator: Zhou Jian. Topical meeting at the XXIInd World Architecture Congress in Istanbul, Turkey. Organized by UIA (Union of International Architects). Presenters Henrik Valeur and Fredrik Fritzson. The urban region includes not only the city and its suburbs, but also the provincial towns, the rural districts and the nature reserves. In fact, it has no clear external borders. Instead it has plenty of internal ones. Panel debate at DAC | Danish Architecture Centre in Copenhagen, Denmark. Organized by the Danish Town Planning Institute. Panel: Henrik Valeur, Bent Flyvbjerg and Peter Hartoft-Nielsen. Moderator: Kent Martinussen. Symposium at DAC | Danish Architecture Centre in Copenhagen, Denmark. Organized by CoMa in collaboration with and supported by the Greater Copenhagen Authority and Region Skåne. Panel: Jan Engell, Regional Planner, the Planning Division, the Greater Copenhagen Authority; Charlotte Lindström, Chief Administrator, Planning and Environment, Region Skåne; Mats Olsson, Director of City Planning, the City of Malmö; Martin Holgaard, Chief Planner, the Municipality of Roskilde; Henrik Valeur and Fredrik Fritzson. Moderator: Morten Daugaard. Panel debate on the ‘trans glocal city’ at Rooseum Museum in Malmö, Sweden. Organized by AESWAD and the School of Arts and Communication at Malmö University, Sweden. Panel: Henrik Valeur, Fredrik Fritzson, Tina Giannopoulos and Per Markku Ristilammi. Public debate at Form/Design Center in Malmö, Sweden. Presenters and organizers: Henrik Valeur and Fredrik Fritzson. From the ancient city-states to the industrial metropolises different societies have expressed themselves through different patterns of urban organization. Perhaps it is possible to see the emerging urban regions as manifestations of a new multicultural society. Panel-debate at DAC | Danish Architecture Centre in Copenhagen, Denmark. Organized by the Federation of Danish Architects and DAC | Danish Architecture Centre. Panel: Henrik Valeur and Carsten Thau. Moderator: Kent Martinussen. Public debate at DAC | Danish Architecture Centre in Copenhagen, Denmark. Presenter: Christophe Cornubert. Moderator and organizer: Henrik Valeur. The ’99 initiative sets out to raise a debate about architecture in relation to our time. Symposium in Tuscany, Italy. Organized by Richard Ingersoll, Rice University, Houston. Participants: Henrik Valeur et.al.